If, for any reason, you are not happy with your purchase, then please contact us within 14 days of receipt so that we may work towards a happy resolution. Prior to making a return, you must email info@auntbucky.com to request return authorization, quoting your order number, and stating return reason. Products returned after this date are non-refundable. Exchanges can be requested a maximum of three times. 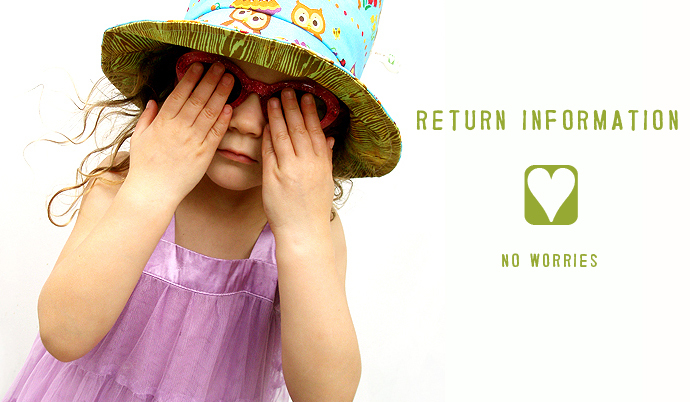 If you decide to return your purchase, then you can return the item for a refund less shipping and a 10% restocking fee. Please contact us before shipping, and mail the item(s) back to us insured and in their original packaging within 14 days of receiving. All items are sent with delivery confirmation, so we have the exact date of delivery. *All our SALE items are FINAL SALES-NO Returns or Exchanges.